These boots are lined with a cotton drill vamp for good air flow, and the insole has a removable comfort cushion featuring dual density Ultimate Shock Absorption Footbed on Poron 4000. Walking around on pillows, you may just forget you’re at work. 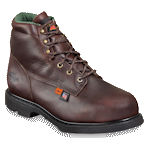 Thorogood delivers high performance in this 8 inch American Heritage work boot. Not only is it a treat for your feet, but it offers superior protection against work place hazards. This work boot features a safety toe.